As a result of IMATA’s Certification, Delphinus Puerto Morelos and Interactive Aquarium Cancun reassert their commitment to the human care and ethical management of marine mammals through compliance with the highest training standards for animal welfare. Practices such as training, public exhibition, research, breeding, conservation, and environmental education were the basis to award the IMATA Certification to both facilities. Cancun, Quintana Roo, November 30, 2016. Delphinus Puerto Morelos and Interactive Aquarium Cancun joined in the community of members of the renowned International Marine Animal Trainer’s Association, IMATA, since both facilities met the stringent standards for the training of marine mammals established by this organization after a process of documentary audit and classroom training. This recognition was made public during the annual IMATA Convention held recently in San Diego, California. And indeed, the experience that the facilities offer to the public encourages the emotional and personal connection that promotes conservation of marine species and environments. In the case of the Interactive Aquarium Cancun, this connection is achieved through sensory experiences in which visitors become aware of other forms of life that exist on the planet, especially those that are not within the reach of everyday life, promoting an emotional and intellectual bond with these species to create a commitment to the care and preservation of the oceans; this is also shared by Delphinus Puerto Morelos since thanks to the interaction with dolphins and the unique experience they bring, visitors are driven by the desire to ensure animal welfare and conservation of the planet. IMATA provides opportunities so marine animal trainers may exchange and disseminate information on knowledge, research and current training in professional and social areas. This Certification provides and promotes professional, efficacious and humanitarian care of marine animals in all habitats; likewise, it recognizes the effort of the facilities that have exceptional systems for the training, science and the art of animal training through the implementation of positive reinforcement. 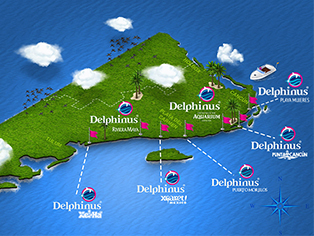 Meet the Animal Care Specialists of Delphinus by yourself, and discover the magic that evolve this incredible work and magnificent care that they have with all the dolphin's family.